BCR ... "Mature, spidery rosette to 25cm. diameter x 15cm. high. Silvery-grey, narrow, channeled, arching leaves. Erect / arching spike to 20cm. long with white bracts and white flowers. Originally in 1984, Corn Bak BV nursery imported from Olmos, northern Peru a batch of T. cacticola which all turned out to be the normal, pink-bracted, white-flowered form. However, circa 1990, self-set seed from one plant in that batch later (2003) produced one plant which flowered with white bracts. Results are still awaiting (2017) whether this species variant will continue to produce white-bracted progeny from self-set seed. This cultivar is considered very slow growing and produces only one or two offsets. Named after the animated cartoon character Casper the Friendly Ghost. Reg. Doc.11/2017 by G Lawn. 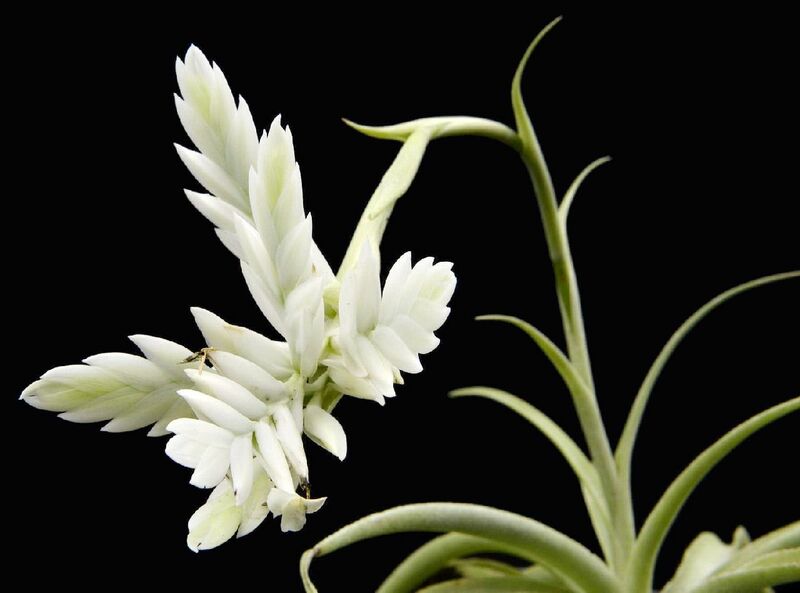 Country of origin: Netherlands ~1990"
Peter Tristram ... "It has taken close on 10 years for this white bracted and flowered form of T. cacticola (ex BRT) to recover from near death after a good gassing to finally bloom. I thought it had died after finding the label under a shelf but thankfully a tiny pup had survived. Maybe it needs a name, Pam?" Bob Hudson ... "A little bit different to the norm. Maybe 'Casper' he is the friendly ghost!!!!!!" Pamela Koide-Hyatt ... "I originally acquired this plant from Peter Bak. 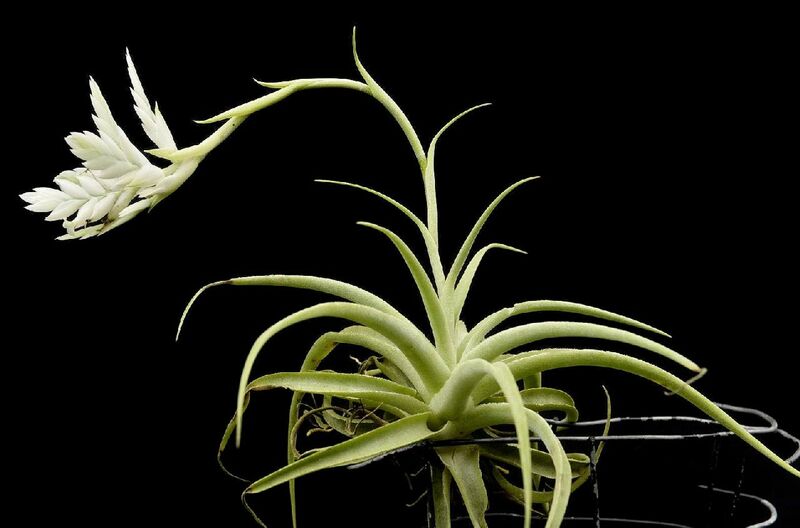 We always call it "T. cacticola Alba". It is a SLOW grower, and only produces one, maybe two offsets." Geoff Lawn ... "Now registered as T. Casper."